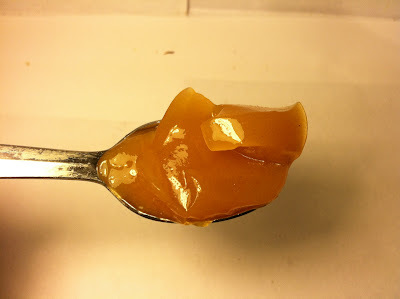 On my Walden Farms Caramel Dip post, a commenter mentioned that they run a health food store where they allow customers to try out Walden Farms products prior to buying them so that they can determine whether they want to fork over the cash for the sometimes costly products. Personally, I think that is a great idea, but since not everyone has access to those kind of well run stores, my goal is to review as many Walden Farms products as possible on this blog and that leads me to the Apple Butter Fruit Spread that I picked up via Amazon.com (they were the re-seller for VitaCost.com) for $3.75. I LOVE apple butter, so after I made my order and received it on my door step, I was VERY anxious to try this one out. This container is twelve ounces and like all Walden Farms products, it is both sugar and calorie free. Like I've said in prior fruit spread reviews, there's not a lot to the actual texture of these since they are just fruit spreads. Basically, they are jelly and that's about it. This container of Apple Butter was no different. One thing I did notice that was slightly different from the other fruit spreads was that there was not as much water sloshing around, so not having that visual provided some mental comfort, I guess. I will say though that on smell alone, they were off to a good start because this one smelled like apple butter and being a HUGE apple butter lover, especially on fried biscuits, I was very excited for this. The smell was a good indicator, because this one tasted pretty much like apple butter too. The taste was a powerful apple taste with what I thought was a very slight hint of cinnamon on the end, even though the ingredient list does not list that cinnamon is an ingredient. It lacked the creaminess or thickness of apple butter, but since this is a fruit spread, it would be foolish of me to expect that. Still, this was close enough to that taste to be willing to forgive that slight difference. All in all, this was a good product and an excellent re-creation of a normal food that is far from healthy. Buy It or Fly By It? You've so got to BUY IT. Honestly, I thought this was incredible. I was just using it as a dip at first, but I'm very much looking forward to using this on toast, bagels, whatever. Heck, I'd just eat it with a spoon like ice cream if it came down to it. That's how much I liked this one and I think if you like apple butter yourself, you may have feelings as strong or near to mine. Walden Farms products can get expensive, but in this case, the expense is worth it. Hey Man, Another solid review.... I agree with you on all points. BUT did you hear the news? Walden Farms just released TWO new PB spreads (one a raisin /cinnamon and the other is chocolate). YOU have an obligation to buy it, review it, and make sure I don't waste my money-haha. Seriously though. I want to hear what you think and see if I need to go out and get it. If the PB chocolate is like Nutellea in anyway, that would be a huge plus! Not really sure how to use the cinnamon one though. Wow, I had not heard that. I'm going to have to start looking for a deal on that since I refuse to pay the absurd amounts that Walden Farms charges for the products through their website. PLEASE post your thoughts on the new PB spreads. 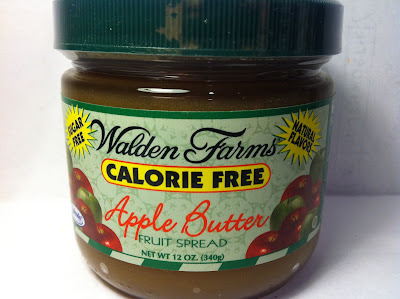 I like a lot of the Walden Farms products and I use the plain PB spread already. But I am really curious about the NEW PB flavors...I wonder if the Choc/PB will be a decent replacement for Nutella? Cinnamon Raisin - I liked it; sort of reminded me of a cinnamon raisin bagel w/ peanut butter. There were bits of raisin. Chocolate - reminded me of what I get when I mix the chocolate dip with the peanut spread.....maybe a little less chocolate and more peanut. Both had a strong peanut flavor, and both were a little less 'solid' than the plain spread (maybe because of the heat? I've noticed that the consistency seems to vary in their products from jar to jar). I'll probably by again, but I don't think they'll get new converts with these. Good luck, and thanks again to Crazy Food Dude for all the crazy awesome reviews! Thanks for sharing! I think I will pass on these. I like the PB plain alot. I just don't see the use for the Cinnamon Raisin (I can add my own cinnamon and raisin when I want to the plain), and the one product from Walden Farms that I really have not liked is the chocolate. So if the Choc/PB taste like the Walden Farms chocolate, then I am going to pass. I really was hopeing for a good Nutella substitute.